Video Tracking provides a comprehensive treatment of the fundamental aspects of algorithm and application development for the task of estimating, over time, the position of objects of interest seen through cameras. Starting from the general problem definition and a review of existing and emerging video tracking applications, the book discusses popular methods, such as those based on correlation and gradient-descent. Using practical examples, the reader is introduced to the advantages and limitations of deterministic approaches, and is then guided toward more advanced video tracking solutions, such as those based on the Bayes' recursive framework and on Random Finite Sets. Key features: * Discusses the design choices and implementation issues required to turn the underlying mathematical models into a real-world effective tracking systems. * Provides block diagrams and simil-code implementation of the algorithms. * Reviews methods to evaluate the performance of video trackers - this is identified as a major problem by end-users. 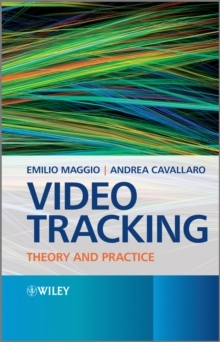 The book aims to help researchers and practitioners develop techniques and solutions based on the potential of video tracking applications. The design methodologies discussed throughout the book provide guidelines for developers in the industry working on vision-based applications.